Bobber and something I really like and thought that you would too. 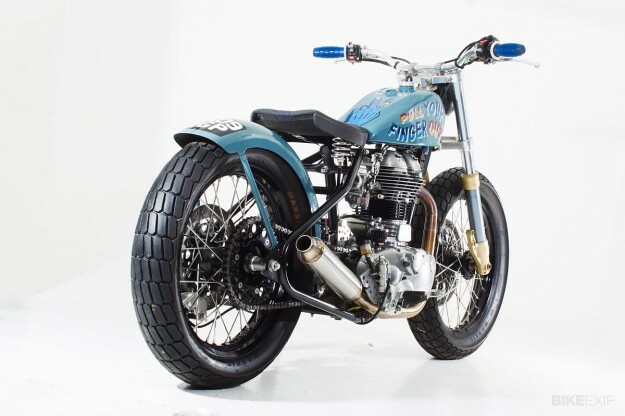 After 50 years of production in India, Royal Enfield had worked hard to update their range, first with a unit construction engine, then fuel injection and after all that the only thing on Sideburn magazine’s mind was making the 2009 Bullet Classic look like a mid-‘60s flat track racer. 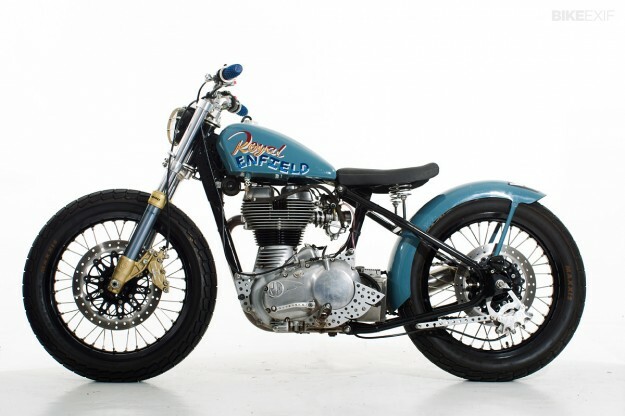 Only half the frame and the engine remains from the original bike that was supplied to Sideburn by UK Royal Enfield specialists, Watsonian-Squire. Lots of parts came from friends. Or we already had them, and were waiting for the right bike to come along. The alloy tank was custom-made for a friend’s dirt track race bike, but he was never happy with it, so we bought it for a fraction of having one made. The Bimota YB9 triple clamps and Paoli forks were £120 off eBay. The wheels, Excel 19-inch rims with Honda CRF450 hubs and Maxxis tires, were bought from a friend who was selling his dirt tracker. The tractor headlight was a gift; so was the bobbed Indian Sport Scout rear mudguard and the rear four-piston Performance Machine caliper. The hardtail loop is by David Bird from Lowbrow Customs, but we had Co-Built shorten the bottom rail to retain the stock wheelbase. Co-Built also made the stainless exhaust. CFM of Lincolnshire, UK, did a great job of making all the very disparate parts fit together, fabricating brackets, footrest hangers; finding used Japanese master cylinders, switchgear and footpegs on the cheap; repositioning the battery; making the rear fender struts; cutting down the original twin seat and converting it to act as a sprung saddle. Steve Adams then covered it with a panel of real stingray skin. The biggest challenge was converting the ignition to work with the Mikuni carb, rather than fuel injection. EFI is good, but we really wanted a simple loom and no fuel pump for this bike. Rupe’s Rewires made the loom. 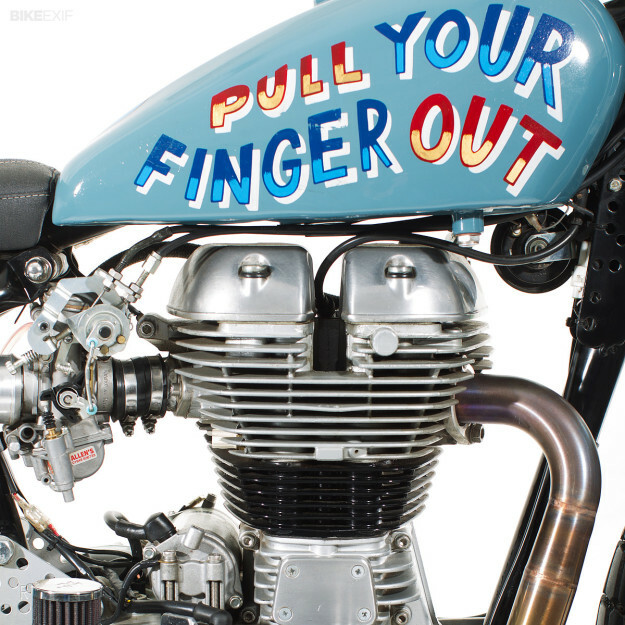 When this bike was built there was no off-the-shelf kit to convert the ignition from EFI, like there is now, but CFM worked it out. The brake discs were special orders from Discacciati in Italy. 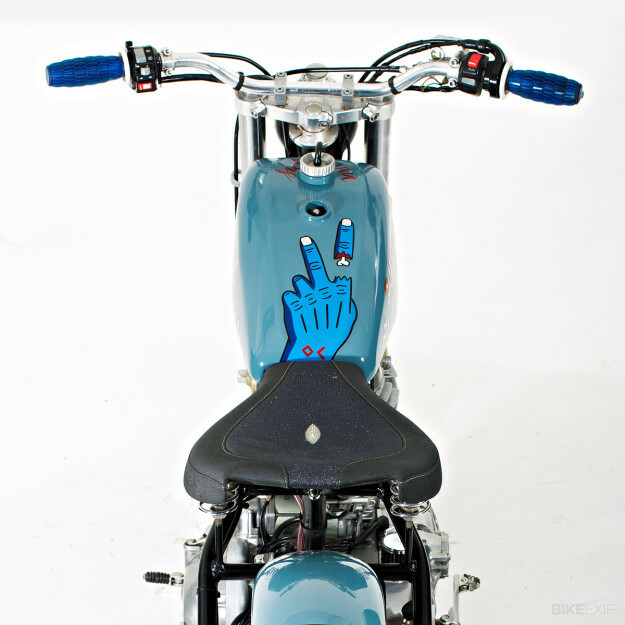 The final touch was the Ornamental Conifer paintwork on the blue base, one of the first customer bikes he painted. The bike has competed in Sideburn’s Dirt Quake event twice, finishing on the podium in the Street Tracker class both times. 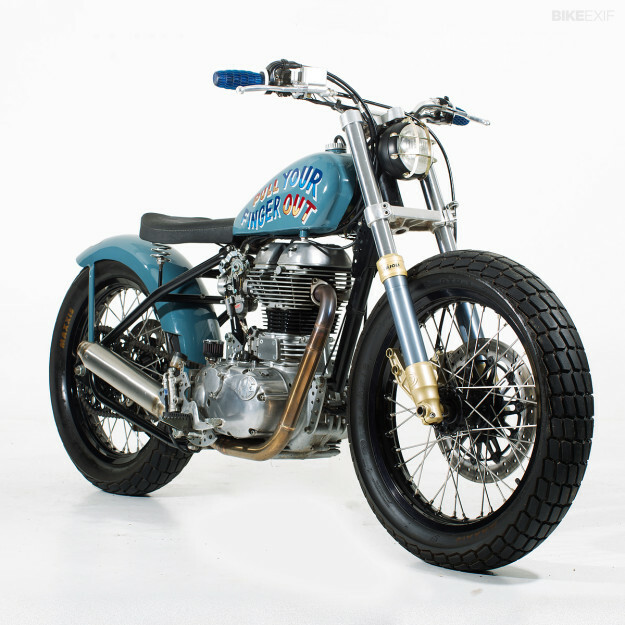 This entry was posted in Blog and tagged bobber, brat, british bikes, cafe racer, chopper, classic bike, custom, hand built, hot rod, low brow, old school, royal enfield, street rod, tracker, vintage iron, vintage motorcycle.